Various Artists - "# 3 Nubian music CDs: Ali Hassan Kuban + Mahmoud Fadl + Salamat"
Nubian music is a legendary and storied affair. "On entering paradise you may hear the sound of nightingales and Nubian singers...", so said the stories of the One Thousand and One Nights. 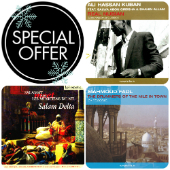 With our limited edition offer, you get the chance to explore the depths of this reach music tradition with some of its masters; Ali Hassan Kuban, Salamat and Mahmoud Fadl.